GO Team Materials Distribution – Members who attended the September GO Team training and/or have signed up with the County Party can pick up their voter address lists and door hangers at this meeting. Feel free to reach out to us if you have any questions on the materials or need a refresher. Discussion on General Election Ballot Measures – We will hold a discussion on all ballot measures that will appear on the general election ballot for voters in San Diego County. A representative from the League of Women Voters will lead the discussion. Presentation of new PB Democratic Club Website – The PB Democratic Club has created a new website. We’ll be presenting it and discussing the new features. For those of you who signed up for the County Party’s GO Team, please complete your precinct assignments between October 5th and October 21st. Volunteer with a Campaign: We encourage you to contact the campaigns of our endorsed candidates and help them canvass, phone bank, or whatever else they need to get the word out! JOIN THE PBDC – RENEW YOUR MEMBERSHIP! Your membership with the club makes sure that you are directly linked to all of the exciting, important, and critical work your fellow members and sister organizations are doing at the local, county, state and national level to promote Democratic values and principles. Join or Renew your membership today. Email us if you have any questions. Join us for an all-important Get Out the Vote training in September! And we’re excited to have Assemblymember Todd Gloria as a featured speaker. We think it’ll be the most important club meeting of the year! Go Team Training – GO Team canvassing on behalf of the SD County Democratic Party with door hangers or by phone is the single most significant action all of us can take to positively impact the upcoming November 6th Election! The SD County Democratic Party volunteer trainer will provide a free, quick, and intense GO Team training to attendees. Light snacks and beverages provided. Our national, statewide, and local candidates need our help to get people to vote on November 6th. The 8% to 14% increase in voter turnout that results from even minimal GO Team contact in our precincts could swing the election for multiple close races and initiatives. Your canvassing will take much less time than you think… join us to find out how easy it is to reach out to voters and make a difference. Show your dedication! Channel your anger and determination! Help us to help America restore democratic values! 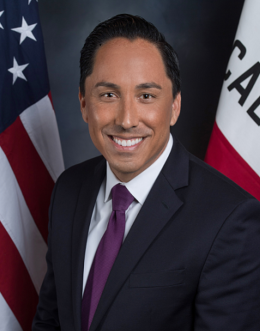 Assemblymember Todd Gloria – In December 2016, Todd Gloria was sworn in as the California State Assemblymember for the 78th Assembly District making him only the second person of Filipino heritage ever elected to the California State Assembly and the Legislature’s only enrolled tribal member. In the Assembly, Todd has continued his advocacy for increased infrastructure investment and pragmatic and innovative solutions to housing and homelessness. To date, Todd has been able to successfully author, pass, and receive the Governor’s signature on 13 pieces of legislation dealing with important issues such as election reform, housing solutions, and cutting government red tape for small businesses. Todd is currently the Assembly’s Majority Whip. Please join Congressman Scott Peters for a Get Out the Vote Event September 9th! Please come and join fellow activists, Indivisible, Progressive groups, and Democratic clubs in phone banking and canvassing for Congressman Peters. Meet fellow Democrats, Progressives, and Congressman Peters and help work to ensure the #BlueWave! Food and drinks will be provided throughout the day and dinner will be served during the evening phone bank with Congressman Peters! When: Sunday, September 9th. Canvassing from 11am – 4pm and Phone Banking from 4 pm – 8pm. Please come out & join Indivisible to help canvass and get out the vote for Dr. Jen, running for City Council District 2 to replace Lorie Zapf. 11am-2pm. Join local Democratic activists knocking doors throughout San Diego as we support two candidates who will fight back against Trump’s hateful agenda. 1pm-3pm. Join SanDiego350 and partners for the next big climate mobilization! Thousands of San Diegans will stand with climate advocates worldwide for this global day of action ahead of the Global Climate Action Summit in San Francisco. 10am-2pm, Civic Center Plaza. A big thank you for attending PBDC’s annual summer picnic! We had a blast, and we hope you did, too. You won’t want to miss this month’s meeting featuring our very own San Diego City Attorney, Mara Elliot. Listen to Mara talk about local issues and hear her answer your questions. Mara W. Elliott was elected City Attorney of San Diego in 2016 after serving as the Chief Deputy City Attorney for the Office’s Public Services Section and legal adviser to the City’s Independent Audit Committee and Environment Committee. Mara and the lawyers in her section held polluters accountable, reformed city contracting, cut administrative red tape, and strengthened the city’s Living Wage and Non-Discrimination in Contracting Ordinances. Neil Gerber, Project Developer with Sullivan Solar Power. Neil will cover some solar basics, time of use rates, and battery storage. Dan King, Assistant City Manager for Solana Beach. Solana Beach is the first city in San Diego county to switch to community choice energy. Dan will speak about the city’s decision to adopt CCE and their experience thus far. Paul Cleary, Executive Director for GRID Alternatives San Diego. GRID Alternatives San Diego bridges the solar divide, bringing solar energy to low-income families who couldn’t otherwise afford it while training the green workforce of tomorrow. Paul will talk about what GRID Alternatives is currently doing in the SD community. Remember that everyone is welcome to attend our monthly meetings. If you are a club member, bring a friend along this month. Coffee and water are always provided along with snacks. Feel free to contribute by bringing your favorite snack to share. Also, don’t forget to join us at Stone Brewery (2816 Historic Decatur Road) on Friday, July 27th for “Drinks with Donkeys”. This friendly get together of like-minded people is open to all and just a great way to unwind after a busy week. We will be there from 6-9 pm. 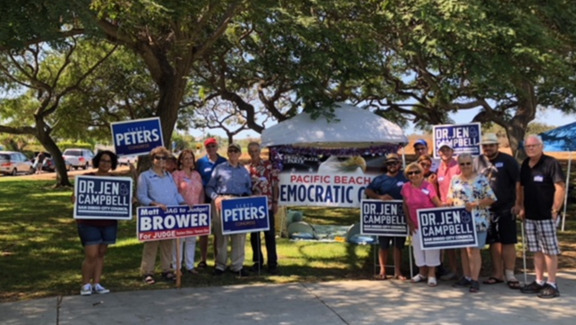 The Pacific Beach Democratic Club is proud to announce the endorsements of Jennifer H. Campbell,MD, who is running for San Diego City Council District 2 and Nathan Fletcher, candidate for District 4 County Supervisors in the November 6, 2018 General Election. 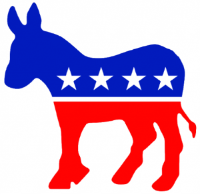 Following the results of the June Primary, the PB Democratic Club voted at their monthly meeting held July 12, 2018 to endorse these two candidates. Hello all! Please mark your calendars for our general membership meeting in July. This meeting will be a post-primaries candidate endorsement meeting. Dr. Jen Campbell – PBDC is excited to welcome back Dr. Jen Campbell. Dr. Jen was one of the top two candidates in the primary election for City Council District 2, and will move on to face Councilwoman Lori Zapf in the midterm election in November. Dr. Jen is a family physician, professor, businesswoman, and grandmother of nine. Her lifelong activity in the Democratic Party has included positions on the local, state, and national levels. Some of her other community service, here in San Diego, includes teaching Integrative Medicine, serving on the Board and as Interim Executive Director of the Human Dignity Foundation, and as a Director of the Clairemont Town Council. Nathan Fletcher – A surrogate will be speaking on behalf of Nathan Fletcher and his campaign. Nathan Fletcher was the top vote winner in the primary election for County Board District 4, and will move on to face former District Attorney, Bonnie Dumanis, in the midterm election in November. Nathan is a former two-term state assemblyman for the 75th District, and a former San Diego mayoral candidate. He is currently a political science professor at UCSD. Fletcher served in the Marine Corps as a Counterintelligence Specialist and did two combat tours. Fletcher founded the Three Wise Men Foundation to help eliminate the stigma surrounding Post-Traumatic Stress and launched the Honorably Discharged, Dishonorably Deported campaign to shine a light on the injustice of deported veterans. 1) SCOTUS: Justice Kennedy announced his retirement from the Supreme Court this week. Trump and the GOP majority Senate are aiming to confirm a new conservative Justice to the Supreme Court by the fall. Call the senators listed below and ask them not to hold nomination hearings until after the midterm elections. Also call our Senators, Feinstein and Harris, to express support for this position. The Congressional Switchboard number is (202) 224-3121 and their D.C. office numbers are listed below. 2) There are voter registration and Get Out the Vote (GOTV) efforts available for you to take part in, and PBDC plans to host fundraisers, phone banks, and precinct walks as the election gets closer. If you’re interested in getting involved, please email us at PBDC92109@gmail.com. To volunteer with the SD County Democratic party, please see https://sdcdp.ngpvanhost.com/action-center-things-you-can-do-today. You can also visit the websites of Democratic candidates to volunteer for their campaigns. It’s back! Please join us for some drinks and some fun with your fellow Democrats! PBDC will be hosting this event at a location TBD. We’ll have more details at the July meeting and send out a reminder as it gets closer. Come on out to our annual summer picnic! The PBDC executive board will be providing burgers and drinks, but it’ll be a side dish potluck, so please let us know what you’re going to bring. Also, bring along your lawn chairs if you want to sit down and relax. With the Primary Election behind us, it’s time to take a breath, reflect on the work that we’ve done, and prepare ourselves for the hard work that will be required to generate the Blue Wave that will set our country back on a path to compassion and sensibility. At June’s General Membership Meeting, Dr. Joel Day spoke with our club about the direction of the Democratic Party. He described a vision of the Democratic Party being a force for good in the world. He gave a vision of a party that accomplishes big things. A party that wants to invest in America so that we can solve our crisis of confidence. His discussion helped me recognize that Democrats need to be able to communicate our ideals as quickly and effectively as Republicans. Democrats want to be a force for good in the world because we understand that empathy and compassion are more powerful than greed and cruelty. Democrats want to accomplish big things, like solving Energy Independence, because it will make us safer from environmental catastrophe and from our dependence on foreign nations. Democrats want to restore confidence in our American Government because government can be a powerful force for good in the world. I am asking you to really think about why you talk to your friends and neighbors; why you knock on doors. Think about the reasons you will continue to make calls, attend rallies, and register new voters. Ask yourself why we stand in solidarity with our Immigrant and Muslim communities. Then take the core of those reasons and edit them down so they can be easily communicated in a few sentences. Now is the time to offer our vision to restore our country to its rightful place as a force for good.